The benchmarking indices ended on a negative note for the sixth straight trade session on Monday, amid weak global cues, weak manufacturing data from China. Mumbai: The benchmarking indices ended on a negative note for the sixth straight trade session on Monday, amid weak global cues, weak manufacturing data from China. The market trimmed losses in the last hour of trade as buying picked up in RIL, ITC and Infosys in the closing bell. Now, all eyes are on Bihar polls and winning by NDA would lift investor sentiment and even set a new range. Sensex closed down 98 points at 26,559 and Nifty declined 15 points to close at 8,051. The broader markets were closed mixed with midcap gained 0.1 per cent and smallcap down 0.2 per cent. On the sectoral front, the metal index was the top loser down by 1.9 per cent followed by capital goods, healthcare and power indices. Auto shares have gained with the news of increased sales in October, Maruti closed up 1 per cent, M&M up 2.2 per cent, however, Bajaj Auto down 4.9 per cent as its total sales dipped. However, metal stocks dropped after economic data from China. 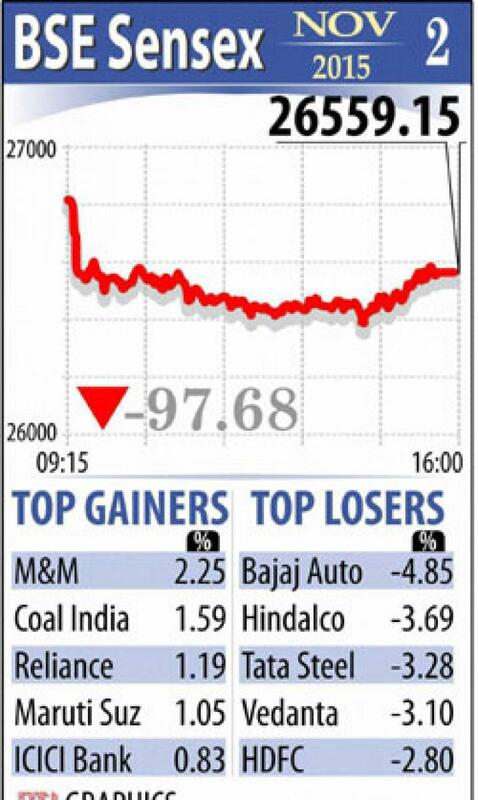 Vedanta, Hindalco and Tata Steel were down over 3 per cent each. The gainers: Mahindra and Mahindra (M&M), up 2.25 per cent at Rs 1,209.15; Coal India, up 1.59 per cent at Rs 325; Reliance Industries, up 1.19 per cent at Rs 959.15; Maruti Suzuki, up 1.05 per cent at Rs 4,495.35 and ICICI Bank, up 0.83 per cent at Rs 279.30. The losers: Bajaj Auto, down 4.85 per cent at Rs 2,426; Hindalco Industries, down 3.69 per cent at Rs 80.95; Tata Steel, down 3.28 per cent at Rs 238.65; Vedanta, down 3.10 per cent at Rs 96.90 and HDFC, down 2.80 per cent at Rs 1,221.95.